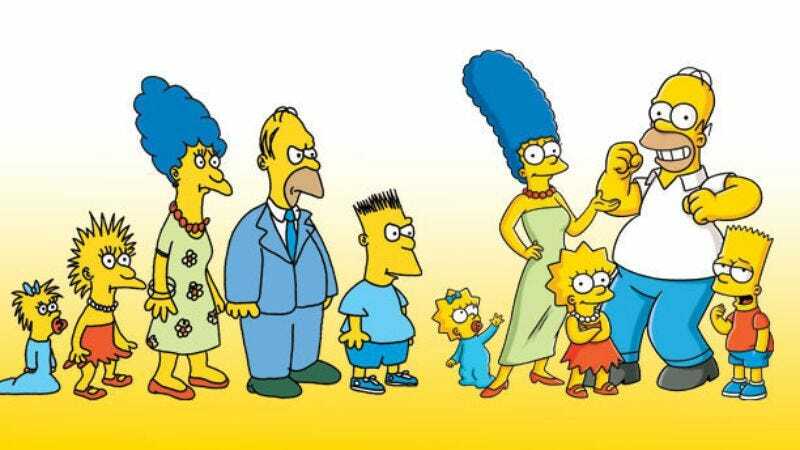 Amid a season that will already see the show crossing paths with Futurama and Family Guy (and apparently Bob’s Burgers within that), The Simpsons will now come face-to-face with another animated series to which it has only the most superficial of resemblances: old Simpsons. According to Entertainment Weekly, this year’s 25th “Treehouse Of Horror” will not only have viewers beholding the ravages of age upon themselves, but also upon the show, as the Simpsons family encounters the Simpsons family as they looked circa 1987-1990. That was a time when Tracy Ullman was entertaining America with songs, sketches, and crudely drawn filler material—and now the lattermost, at least, will be coming back to haunt us all. The “Treehouse” segment is structured as a parody of The Others, with the Simpsons discovering they share their home with another ghost family that looks and sounds a lot like them, if maybe they were left on a radiator overnight. As showrunner Al Jean points out, “We’ve implied that they were murdered and buried under the house, so this is expanding that thought.” He’s referring there to their corpses’ brief cameo in the episode “Adventures In Baby Getting,” but also to the Guillermo del Toro-directed sequence from last year’s “Treehouse” that, [SNORT], clearly depicted them as being buried under Springfield Nuclear Power Plant. I mean, are we to believe that this is some sort of, ha, magic power plant that’s also the Simpsons’ house or something? Boy, I really hope that someone etc. etc. No word on whether the episode will also reveal where Tracey Ullman is buried.